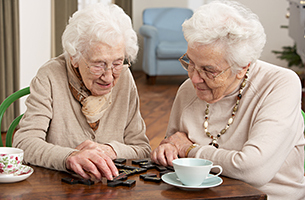 It is a common belief that games which stimulate the brain can also help to combat many brain-related medical conditions such as dementia and Alzheimer’s. Read on to know the advantages of such games for seniors. 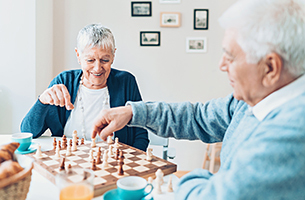 The experts in our skilled nursing facility believe that engaging in activities that increase your learning ability can help improve the cognitive capacity and health of the brain. A mild challenge to the mind to learn new skills and easy games can enhance mental well-being and help have a positive attitude. Memory games can help the brain to recall information. The card game of Match, electronic game of Simon, and Bop-It which requires you to use memory and follow directions are a few of the memory games that can help you focus on remembering and recalling things. Word games typically include those where you are required to fill in missing words, find hidden ones and more. They can also be interactive. Hangman, Scrabble, Word Search, Crosswords are a few easy and engaging word games that you can play. Board and card games challenge you to use many tactics and strategies to anticipate the future moves, weigh the pros and cons of each, and plan yours accordingly. Chess, Checkers, Go Fish, and Solitaire are a few that require thinking, planning, and visualizing the consequences of each move. Trivia games are similar to quizzes which require you to recall details, facts, and data related to a variety of topics such as history, geography, politics, movies, music, and more. Playing them also motivates you to memorize new pieces of information. 5-Second Rule and Trivial Pursuit are interactive and exciting games that encourage you to think quickly and act under time restraints. The best thing about mobile games is that you can play them anywhere and even when you are alone. Family Feud, Wheel of Fortune, and Jeopardy are a few that you can try playing. Senior-friendly versions with large texts and buttons are also available. If you have any questions about our facility or services, reach out to the representatives in our skilled nursing facility by calling 401-765-1440. You could also fill out our online form to book a tour and request a consultation. We are located in Manville RI.